After their car broke down, Waikato Police gave Megan and Anthony Bonisch a lift to a wedding they were attending near Tauranga. Photo: Waikato Police/ facebook. It might have been Megan and Anthony Bonisch's first ride in a police car, but it was a welcome one. 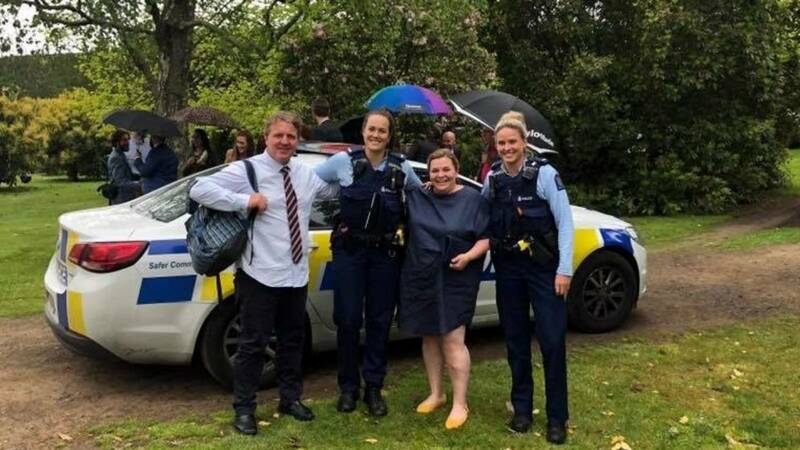 When the Auckland couple found themselves stranded on the side of a Waikato highway at the weekend, running late to a wedding, it was police officers that came to their aid. The pair were driving down from Auckland to a wedding on the northern outskirts of Tauranga on Saturday when their car broke down. In a post on Facebook, Megan Bonisch says the car suddenly lost power near Waihi. With 50 minutes to get to the venue - a 30-minute drive away - little chance of a taxi or Uber, and a car that wouldn't travel more than 30kmh - the pair began to fret. On went the hazard lights, she said, and the thinking caps on what to do next. As the couple pondered the predicament, a police car with two officers drove past in the opposite direction, returning to stop. "We explained what had happened and where we were going - not only did they follow us back to Waihi police station so we could safely leave our car, they let us get changed in the police station." Then the two policewomen offered to drive the pair in the patrol car to the wedding venue, she says. "We made it in time (and arrived in style) and had a wonderful evening." "I am so grateful to live in a country where the police can show such compassion and kindness by helping us out when they could just have easily not. "These two are a credit to the NZ Police and their profession." She thanked the officers for helping them out and providing a "grand entrance". "And making our first ever journey in a police car so memorable."